Actually what happens, some people go to work in a job and will be content to stay in their initial position all of their working life. There are jobs that do not lead to promotions so the employee need to gain additional skills or move to a different company to be promoted but only few of such persons take such step. While on the other hand some people do not want to “climb the ladder” in business. They may not want the additional stress or responsibility that could come from moving up to the next position. Many times people who stay in one job for their entire working career will make more income than someone who has a more “prestigious” position. If they work hard, are dependable and efficient, their yearly raises can enable them to accumulate an income larger than their education or experience would afford them in a different work area. So career-oriented people have a goal that involves constantly learning new skills in addition to being dependable and efficient. They focus on making each job an opportunity to develop skills leading to their next position or assignment. They work through the entry level jobs and know they can always learn a new skill to help them move up the career ladder. A person has to gain experience in the area they wish to excel in. There are some well paid employees who started out working at a fast food restaurant and moved into the “Manager Trainee” program. 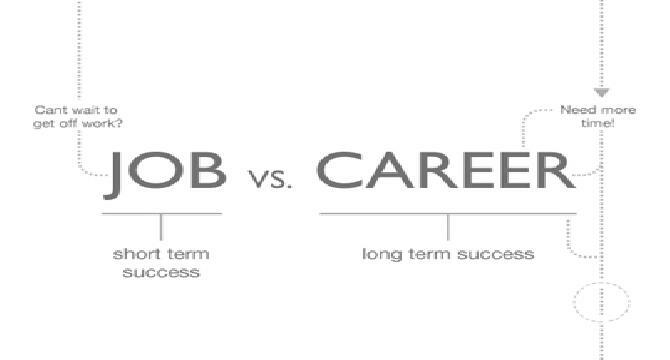 Lastly, each person measures the success of their career differently. Some career-oriented people measure their success by their income, while others measure their success by the number of people they are able to help. Many people who work in the non-profit area or government may make quite a bit less than if they used their skills in the public workplace. People with careers are problem solvers. In fact, career employees usually look at problems as opportunities. A career-oriented person would probably develop a plan and start working their way through each barrier, never allowing themselves to be stagnant or to give up on their dream.